The oblong scarf measures 14 x 60. It contains a combination of colors including ivory, dark brown, light sage, cinnamon, dark rust and light peach, with gorgeous shimmering threads running throughout that catch the light beautifully. 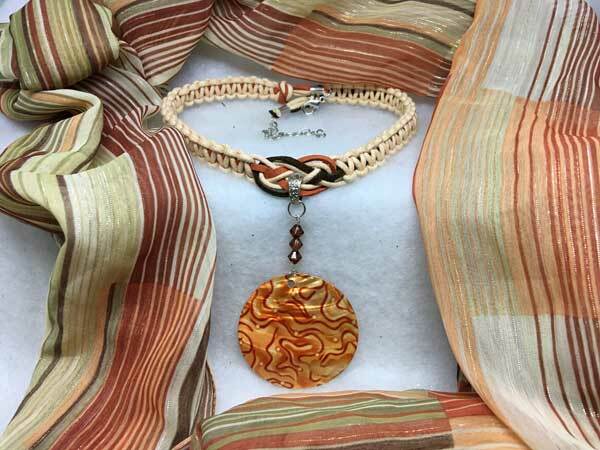 This corded necklace is made using waxed cording in combination with suede cord. The length can vary from about 16 1/2 to 19 1/2 inches with a center jeweled piece that adds over 3.5 inches. It is done in ivory, rust and dark brown. The jeweled piece starts with 3 dark-brown bicone crystals. Hanging separately is a large round piece of shell that is overlaid with a lovely rust and ivory combination pattern.